Changes in store for the 2017 edition, produced by the biggest masthead in its history. For Ryerson University journalism students entering their final year, the Ryerson Review of Journalism is a crash course in the multifaceted, multiplatform world of magazine publishing. Each new group of editors builds the magazine from scratch, while striving to attain professional standards, which is both empowering and incredibly challenging. In the end, each masthead decides on what they, as editors, feel the RRJ should be. The circumstances this year were particularly conducive to the kind of experimentation that is desirable in journalism today. For starters, we numbered 25 on the masthead, making us the largest single group of editors in the publication’s history. With a change in instructors—we had two this year, one specializing in print and one specializing in business and digital—and a new chair in the journalism department, it was our chance to try many different things. The additional bodies on the masthead allowed us to divide our operations; our four-person business and audience engagement team, for example, was responsible for managing the budget, selling ads and sponsorships, and making it easier for our readers to support us (goodbye mailing cheques, hello online subscriptions and donations). Of course, the RRJ is also attuned to the larger shifts in the industry and has been striving to grow its online presence. Our goal this year was to build off of last year’s momentum and continue to experiment with our newsletter, podcast, and website. Part of this transformation involved assigning beats to our writers, which they would cover through a mix of news, features, and commentary. 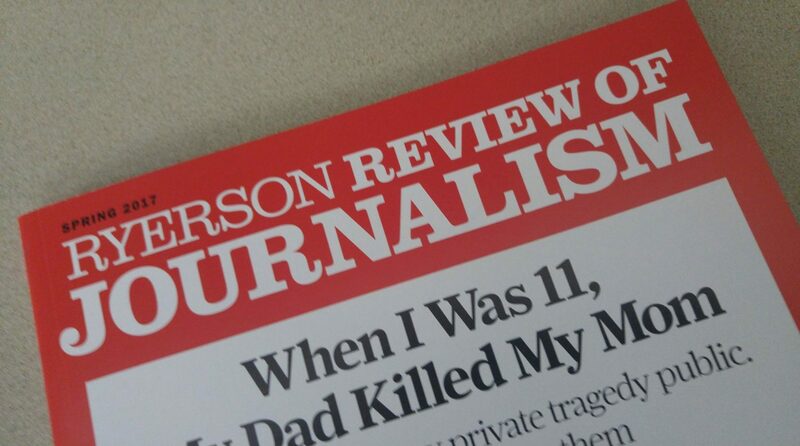 To coincide with the launch of our print issue in April, we will also be rolling out RRJ on Medium. The new platform, which will host our print stories and longer, meditative pieces, is intended to create a friendlier reader experience and to expand our reach to new audiences. To cap this eventful year: our inaugural RRJ conference, “Breaking Barriers in Journalism,” will be held in the Tecumseh Auditorium at Ryerson on April 6. We’re putting it on because, like many other Canadian magazines, we see the value in connecting personally with our audience. The conference will feature panels on surviving as a freelance journalist in Canada and on the gender barriers in photojournalism—two issues explored in our print issue—and a keynote address from Kamal Al-Solaylee, the Ryerson journalism professor and author of Brown, a finalist for the Governor General’s Award for English Non-fiction. Conference attendees can purchase a copy of the magazine, or join us for the official launch at the Rivoli restaurant in Toronto later that evening. Editor’s note, April 5, 2017, 9:10 p.m.: A previous version of this story incorrectly stated that one instructor specialized in digital, the other in business. It should have read that one specializes in print and one specializes in business and digital. We apolgize for the error. Justin Dallaire is a masters of journalism student at Ryerson University and the editor of the Ryerson Review of Journalism’s spring 2017 issue. His work has appeared in the National Post, Ryerson Folio and The Fulcrum.